Last night I attended a focus group. I love focus groups. You go for a couple hours and chat it up about what you do or don’t like about a product or products and they give you swag and some cash! Win win! Last night’s focus group was for a local paper products company called Carolina Pad. We discussed journals. 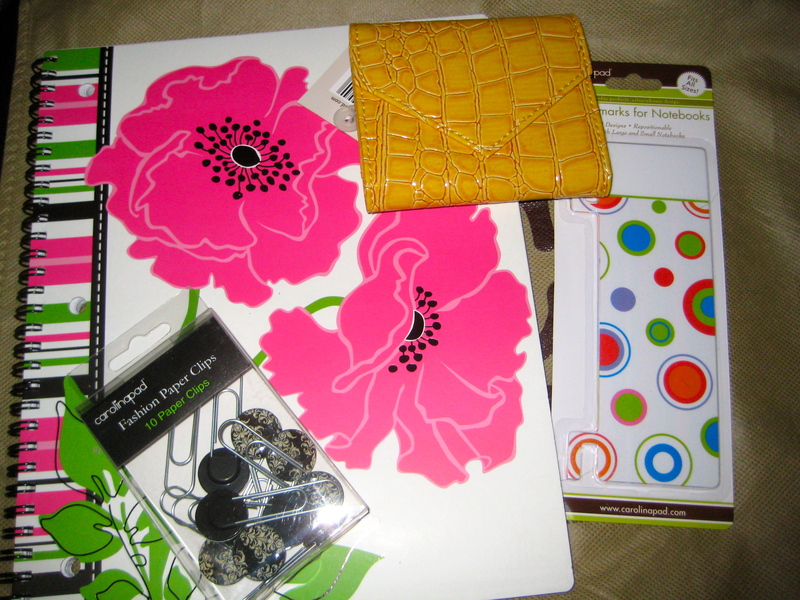 It was fun and I left with a notebook, some bookmarks for said notebook, some schmancy paper clips, and a business card holder/wallet (the yellow thing- I’ll be regifting that as it’s not my color), all in a reusable shopping bag that folds up into its own pouch. Nice! I love Carolina Pad’s products. In fact, I had a BIG giveaway of their products on my blog a while back. Some of their school supplies have been spotted on one of my favorite shows…Glee! How cool is that?!? Their products are available nationwide and on Amazon. And they didn’t pay me for this post. I pimp because I love.